Not to be confused with Montgomery, Ohio. 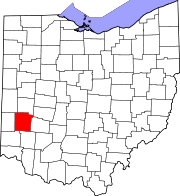 Montgomery County is a county located in the U.S. state of Ohio. As of the 2010 census, the population was 535,153, making it the fifth-most populous county in Ohio. The county seat is Dayton. The county was named in honor of Richard Montgomery, an American Revolutionary War general killed in 1775 while attempting to capture Quebec City, Canada. Montgomery County is part of the Dayton, Ohio Metropolitan Statistical Area. According to the U.S. Census Bureau, the county has a total area of 464 square miles (1,200 km2), of which 462 square miles (1,200 km2) is land and 2.8 square miles (7.3 km2) (0.6%) is water. As of the census of 2000, there were 559,062 people, 229,229 households, and 146,935 families residing in the county. The population density was 1,211 people per square mile (468/km²). There were 248,443 housing units at an average density of 538 per square mile (208/km²). The racial makeup of the county was 76.57% White, 19.86% Black or African American, 0.23% Native American, 1.31% Asian, 0.04% Pacific Islander, 0.49% from other races, and 1.51% from two or more races. 1.27% of the population were Hispanic or Latino of any race. There were 229,229 households out of which 29.60% had children under the age of 18 living with them, 46.30% were married couples living together, 13.80% had a female householder with no husband present, and 35.90% were non-families. 30.40% of all households were made up of individuals, and 10.10% had someone living alone who was 65 years of age or older. The average household size was 2.37, and the average family size was 2.96. In the county, the population was spread out with 24.70% under the age of 18, 9.70% from 18 to 24, 29.00% from 25 to 44, 22.90% from 45 to 64, and 13.70% who were 65 years of age or older. The median age was 36 years. For every 100 females, there were 92.30 males. For every 100 females age 18 and over, there were 88.60 males. The median income for a household in the county was $40,156, and the median income for a family was $50,071. Males had a median income of $38,710 versus $27,297 for females. The per capita income for the county was $21,743. About 8.30% of families and 11.30% of the population were below the poverty line, including 15.60% of those under age 18 and 8.20% of those age 65 or over. As of the 2010 Census, there were 535,153 people, 223,943 households, and 138,060 families residing in the county. The population density was 1,159.5 inhabitants per square mile (447.7/km2). There were 254,775 housing units at an average density of 552.0 per square mile (213.1/km2). The racial makeup of the county was 73.9% white, 20.9% black or African American, 1.7% Asian, 0.2% American Indian, 0.8% from other races, and 2.4% from two or more races. Those of Hispanic or Latino origin made up 2.3% of the population. In terms of ancestry, 24.9% were German, 12.8% were Irish, 9.7% were American, and 8.8% were English. Of the 223,943 households, 29.7% had children under the age of 18 living with them, 41.6% were married couples living together, 15.3% had a female householder with no husband present, 38.4% were non-families, and 32.2% of all households were made up of individuals. The average household size was 2.33, and the average family size was 2.94. The median age was 39.2 years. The median income for a household in the county was $43,965, and the median income for a family was $56,559. Males had a median income of $45,680 versus $34,991 for females. The per capita income for the county was $24,828. About 11.7% of families and 15.7% of the population were below the poverty line, including 22.7% of those under age 18 and 8.7% of those age 65 or over. In the six presidential elections until 2016, Montgomery County has favored the Democratic candidate, but not by large margins. However, in 2016, Republican Donald Trump defeated Democrat Hillary Clinton. It's also the most populated county in Ohio to go for Trump in 2016. Air Force Institute of Technology (actually located in Wright-Patterson AFB, Ohio). Wright State University (actually located in neighbouring Greene County, Ohio, but uses a Dayton address). ^ "Ohio County Profiles: Montgomery County" (PDF). Ohio Department of Development. Archived from the original (PDF) on May 8, 2007. Retrieved April 28, 2007. ^ a b "State & County QuickFacts". United States Census Bureau. Archived from the original on July 15, 2011. Retrieved February 9, 2015. ^ "Ohio 2010 Census Population For Counties" (PDF). Archived from the original (PDF) on 2012-05-30. Retrieved 2011-10-18. ^ "Montgomery County data". Ohio State University Extension Data Center. Archived from the original on 2008-03-27. Retrieved 2007-04-28. ^ "U.S. Decennial Census". United States Census Bureau. Retrieved February 9, 2015. ^ "The City of Moraine -". The City of Moraine. Retrieved 3 April 2018.